When Sarah, Alessa and Ali announced a Fall Essential Sew Along, and doing so by using alliterations like Fashionable Foundations for Frosty Weather and Chic Chemises for Cool Climates, I knew I had to join. Now, I am trying to keep the selfish sewing limited, so I get more time to sew for others, but some things have been waiting patiently in the back of my mind for a while and it is time to pull them out from their hidings. My sewing plans for fall are two dresses, one pair of pants, one pair of shorts, a hat and the refashioning of a blouse. I have tons of other ideas (and UFO´s too), but these six essentials are stuff I have been wanting to make for a while. The cloche is from the Vintage Pattern Lending Library, and is a pattern from 1920. There is one vintage dress pattern from 1968 (Simplicity 7766), that I just recently acquired, but I´ve been wanting to make this kind of style for a while and most importantly, I´ve been looking for an appropriate way of using some gorgeous houndstooth fabric I thrifted last year. The contemporary dress pattern has been on my list of things to make since I saw Allison´s pretty version (Burda 05-2010-103). The pants are from the latest Patrones magazine, and fit the profile for comfortable, yet chic slacks perfectly! The blouse will be (loosely) based on McCall´s 5661 and the shorts are Simplicity 3850, a Built by You pattern. Kristen has made a great pair of shorts using this pattern! I´m really looking forward to sew all of this up, and to see what everyone else is making for fall! Now, the palette is more or less the same as I used as a guidance for my spring sewing. All of the fabrics are from my stash, and both the wool houndstooth, the corduroy and the yellow silk are thrifted. In addition to this sewing, I am currently knitting a cardigan in a teal tweed wool, a design by Kim Hargreaves called Wisdom, and a top, in a silk/rayon blend, called Date Night, and the pattern for that one is available at Knitty.com. You can see my progress at Ravelry, if you´d like! So, there you have it, my sewing and knitting plans for the autumn. How are you all planning your fall sewing? Oh, I love cloche hats! I knitted one last winter but have never sewn one. Yours will be so cute! 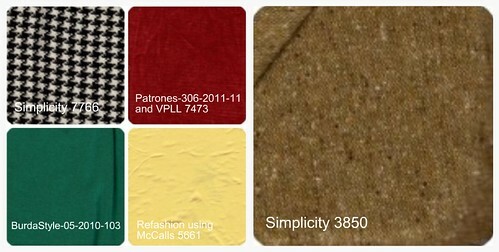 What a fun palette with a gorgeous mix- I think the yellow silk is the business. I like that you’ve chosen a hat- reminding me to dig out my winter accessory making patterns. Looking forward to following your progress. And I think I might be attempting to knit the same cardi but being such a novice I expect it’ll not be ready this year!!! Great autumn plan. I like the colour palette. The dresses look great, simple shapes. I am impressed you are going to make a hat. I am making autumn plans but haven’t blogged them yet. Gorgeous colour palette! I adore the houndstooth. Good luck! I’m looking forward to seeing what you make. Oh I love those cloche hats! I like your pattern and fabric choices very much, especially the hat. I look forward to seeing how everyone in the FESA group does over the next few weeks. Love your plans! I hope to keep up with the sewalong, I need some fall staples! I’m glad you like my shorts, I plan to use the pattern for some trousers next! I looove the colour scheme you have chosen! Simply delicious!